You can hang a sign with many different materials, from nearly invisible monofilament to steel chain. Chose the material that is right for the size and weight of your sign. Jack chain is ideal for hanging signs at varied heights. 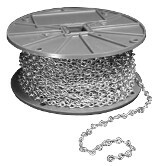 Meant to be cut to the desired length and attached with our 1” s-hooks, jack chain is well suited for both long term and short term installations of large and heavy signs. 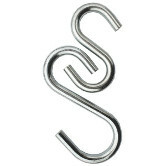 S-hooks are a intended for hanging heavy signs and are often used in combination with our jack chain. S-hooks are also ideal for connecting multiple sign panels, one above another, and are well suited for both temporary and permanent sign installations. Metal beaded chains are often used to connect product samples and swatches to store shelving. They can also be used to connect items to displays, to connect multi-panel hanging signs, or in any other scenario where a flexible, reusable connector is required. 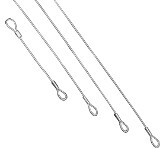 The plastic version of the popular metal bead chain, these handy ties are commonly used to attach tags to merchandise. They are easily adjusted, reusable, and can be quickly assembled by hand. Plastic bead straps can also be used for attaching signs to a variety of mounts and hangers. They are available in black or natural white and in two lengths. Plastic locking straps, also known as security loops, are used to affix tags to product. The straps are tamper resistant since they must be cut to be removed. 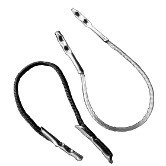 The straps are well suited to rapid hand assembly and are available in two lengths. Note: These straps are sold in packages of 500 only. Jet wires are an adjustable, tangle-free, hanging hook and wire system for light weight and medium weight signs. With just a pull, jet wires “telescope” out to a desired length and then stay at that length, making it easy to adjust the height of your signs. 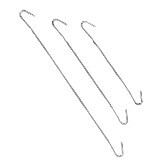 Wire hooks are intended for hanging heavy signs at specific heights. Our shortest wire hooks are also used to hang multiple signs, one above the other. 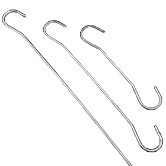 Wire hooks are simple, reliable, and very easy to move or relocate. 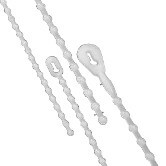 Barbed strings are most often used in light-weight sign hanging and with mobiles. They can also be used to connect multiple sign panels to each other. 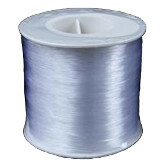 This barbed string is available in black or white, and in lengths from one to twelve inches. 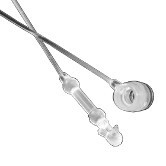 Steel looped-end cable is intended for long term sign hanging. This extra-strong cable is perfect for supporting heavy signs. 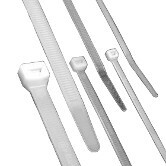 Nylon cable ties are used to affix signs to store shelving, or to connect tags to product. The cable ties are tamper resistant since they must be cut to be removed. Easily adjusted, cable ties are well suited to rapid hand assembly. Extra long ties are available in 36" and 48" lengths. 40 lb. test, clear monofilament can be used for hanging lightweight signs and is virtually invisible, eliminating visual distraction or visual competition with the sign’s graphics. Sold in 450 foot spools.